AiPT! Staff Picks - April 2018 – AiPT! AiPT! Podcast co-host and contributor, Jason Segarra and contributor, Trevor Richardson share their staff picks for the month of April. April is about over and May is just around the corner. Did you watch Infinity War yet? Wow!!! Deadpool 2 and Solo are coming soon! This year is flying by with the quickness. 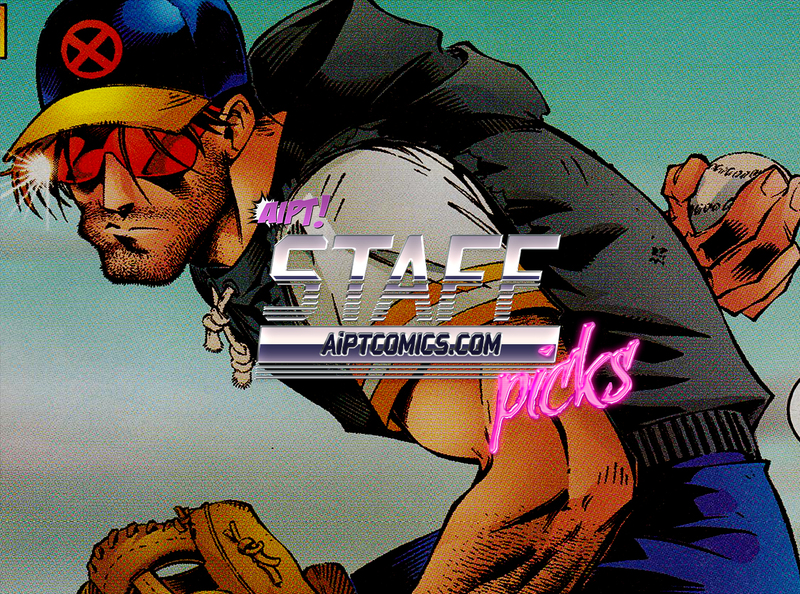 And it is also time for the AiPT Staff Picks! This month, get to know contributor and AiPT Podcast host, Jason Segarra and contributor, Trevor Richardson. Current favorite comic series: Well, since Black Bolt has ended and Snotgirl is on break, my favorite has gotta be The Unbeatable Squirrel Girl. The latest issue (#31) was so moving, so joyful and really reminded me that Squirrel Girl is not only about eating nuts and kicking butts, but really about how we care about each other as friends, as human beings, as living organisms sharing a world/universe. #31 was also Erica Henderson’s last after drawing the series from the start in 2015 (they got relaunched once because Marvel) and even though Derek is going to kill it the series is going to be very different without Henderson’s artwork. Current favorite TV series: I don’t have cable so I don’t keep up with most current series until they get to Netflix, Amazon, etc., but every Thursday night I make time for RuPaul’s Drag Race. After the MESS that was All-Stars 3, Season 10 has felt like a breath of fresh air. The drama, the talent, the lip syncs! Drag Race is spending that we’re-on-VH1-now money well and the show is setting a higher bar than ever. My pick for the top three are Miz Cracker, Monét X Change, and Monique Heart. Reader, I know what you’re thinking. Monét was in the bottom twice in a row. I know, I know, but I have faith she’s gonna turn it around and come back swinging harder than ever. Current gaming addiction: Someone please take away Monster Hunter: World from me so I can ever touch another game again except don’t because it’s so fun! I genuinely haven’t had this much fun playing a game that feels completely unlike anything I’ve played before. I’m deep into High Rank (basically, the second half of the game) and even though the challenges are ramping up, it’s so nice to be able to catch up to my friends who’ve finished the game and hunt together. They’ve also added a couple new monsters since launch and I’m glad I’m far enough now that I can access all the content they’re going to be adding across the rest of the year. Last good movie you saw: I’m always behind in movies. I think it would have to be Black Panther back in February? I barely ever go to the movies anymore but I saw Black Panther twice. I can’t wait to see T’Challa and the Wakandans again in Infinity War! I think the Blu-ray and DVD are coming out soon, so if you haven’t seen Black Panther yet, get on it! Coolest recent purchase: It’s a good thing I preordered the Bloodborne Totaku figure when I did because apparently all the Totakus are sold out now? For ten bucks, it’s a super cool figure that’s near amiibo quality in construction. Bloodborne is one of my favorite games and it’s hard to find affordable merchandise connected to it, so I jumped at the chance to preorder a figure when they were announced. Summer movie season is upon us. What movies are you looking forward to? : Deadpool 2! The first Deadpool is one of my favorite superhero movies so when they announced the sequel, I didn’t even need to hear about Cable, X-Force, any of that to be sold. Like I said, Infinity War is obviously on my radar, even more so because of how good Black Panther was. I’m also definitely going to see Solo because of Donald Glover as Lando and pretty much no other reason? I want to be excited for every Star Wars film, but I’m really ready for them to branch out and make some that aren’t connected to the original trilogy at all. The weather is warming up. What are your favorite outdoor activities? At some point this Spring/Summer I’d love to get out to the National Zoo in D.C. I used to go at least once a year, but I think it’s been a couple since I made it out there. That’s probably the singular only thing I like to do outside. I am the stereotypical pale bedroom lurker that only ventures out for food and cute animals at the zoo. If you were stranded on a desert island, what superhero would you want to be stranded with? Note: can’t be a hero that can swim well or fly. You’re stuck. Deal with it. I feel like I’m cheating a bit, but I’m going to choose Momo Yaoyorozu from My Hero Academia. She can make anything of which she knows the atomic configuration (based on the show, it looks like the essentials will be covered), so she’d be able to spend the first couple weeks making whatever we need to survive. Given how well she knows expensive and classy teas, we’d probably have great tea parties on the island! Current favorite comic series: The Wild Storm. I read a lot of the books the series is based on back in the 90s, so it’s cool to see these updated versions of the characters, but this new series has taken so many left turns from them that it’s definitely its own animal. The real secret weapon of this series, though, is penciler Jon Davis-Hunt, who crafts maybe the best action sequences in the comics game today. Current favorite tv series: Hard to say, really. I guess most recently I’ve been binging My Hero Academia, which is probably the second best Anime about being a superhero I’ve seen in recent years. It’s got a fun cast of characters, some interesting designs and great action scenes. Otherwise, I’m still working through the second season of Jessica Jones, which isn’t as memorable as the previous season. Current gaming addiction: I’ve become a Fortnite devotee. I’m still not very good at it, but I can comfortably finish in the top 10 without resorting to hiding in bushes. I’ve still yet to win, though, so that’s a bummer, but I’m getting better with every session. Last good movie you saw: In theaters it was probably Black Panther, which I thought was pretty good – though maybe not the game changer others believed it to be. Not that I have anything negative to say about it, but I left the theater thinking it was pretty cool, rather than thinking is would shift the landscape of superhero movies or anything like that. Similarly, I only just saw Thor Ragnarok on demand and thought it was a cool/fun movie that was about as good as Black Panther, though clearly in a more comedic fashion. Coolest recent purchase: At C2E2 I bought an original movie poster for Friday the 13th that I’m super excited about. Now I just need to buy a frame big enough for it and figure out where to hang it. Summer movie season is upon us. What movies are you looking forward to? Like most people, I’m excited about Infinity War and Deadpool 2, but the one that I don’t see a lot of people talking about but I’m really juiced for is the Incredibles 2. I loved the first one, as it’s one of the few animated movies that I like about as much as my 9-year old nephew, so I’m excited to see how they handle the sequel. Let’s hope it’s more Toy Story 2 than Cars 2, though. The weather is warming up. What are your favorite outdoor activities? There’s a pretty cool park near my house in Chicago, and mostly I’m just looking forward to hanging out on the green with my dog. Summer in Chicago also brings with it a lot of open-air music festivals in the various neighborhoods around town, so that’s definitely something I look forward to. If you were stranded on a desert island, what superhero would you want to be stranded with. Note: can’t be a hero that can swim well or fly. You’re stuck. Deal with it. Owen Reese, the Molecule Man. The dude is essentially a god, and create pretty much anything he thinks of. So even if we stay on the island, if I want like a steak or a pizza or something, dude can just magic up some s--t and I’ll survive in style. No Gilligan’s Island style huts for us when my boy Owen just creates a dope mansion out of nowhere. Yeah he’s crazy and unstable, but I mean, we can work on that.